The last year has been a busy one for the Gothic Funk Nation. We’ve seen two changes in venue (to Andersonville’s “Hopleaf”) for our Tuesday Funk reading series as it’s gotten bigger and better, and now averages about fifty attendees per reading. The last installment featured Marlon Carey, J-L Deher-Lesaint, Kristin Lueke, Arlene Malinowski, and Megan Stielstra. The creation and launch of our arts journal, The Paramanu Pentaquark (Issue #3 in production) has been featured in publications such as the Chicago Sun-Times, Centerstage Chicago, and Papua New Guinea Gossip, and has published dozens of musicians, writers, and artists from Hawaii to Manchester. A change in venue for the National Address reading circle / workshop to the Barista in Wicker Park. Several artists have brought their novels-, songs-, poems-, and ideas-in-progress to these welcoming and constructive sessions. We’ve thrown a variety of successful parties, from an absinthy magazine launch last February, to our lakeside Mutiny on the Bounty last August, to the more recent mystery of the Kaleidoscope (complete with midnight cemetery damps). While there’s been heavy involvement by longtime members, we’ve seen some new faces as well. Dion Mindykowski made the long trek from Michigan to read at the journal launch, Maggie Kast, William Shunn and others have become regular and eagerly anticipated readers at Tuesday Funk, and Richard Whaling and Elizabeth Moylan have upped their involvement, giving us a much needed adrenaline boost just as we’ve lost several active members to parenthood and the magnetism of foreign capitals. We will send you updates from time to time about the choices we make and developments in the Nation, and will also be resuming monthly Announcement emails starting this February. Update! Changes to Special Event for 10/16. No Tuesday Funk This Month. Due to holidays past and future, there will be no Tuesday Funk this upcoming December 2nd. Please join us for the next Tuesday Funk on January 6th, 2009. 7 PM @ Flourish Cafe in Edgewater. 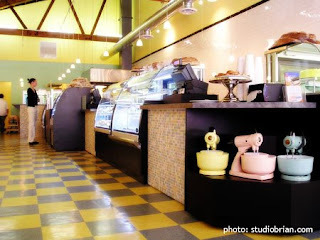 Flourish Bakery Cafe: Our New Host! Starting on October 7th, Tuesday Funk will be hosted by the Flourish Bakery Cafe conveniently located at 1138 West Bryn Mawr, just steps from the Bryn Mawr Red Line stop.